BC Distilled returns to Vancouver on April 18th! 23 of the province’s leading small-batch distilleries along with a handful of artisanal beverage and food purveyors will set up shop at BC’s premier micro-distillery festival. Hosted at CBC Vancouver, this event provides a single-stop opportunity for craft spirit lovers to taste a variety of regionally sourced products. Learn more about each of the distillers below then grab tickets HERE. Opened on Repeal Day December 5th, 2013: the anniversary of Prohibition’s end. The newest venture of the Mark James Group, and takes on the tradition of in house craft production and bottling. Using a blend of traditional and contemporary methods, coupled with the best available BC agricultural product, Wayward is the only distillery in Canada using honey as the base in all recipes. Founded by Marcus VonAlbrecht. His spirits brand XFour showcases a a line of 4 times distilled, quality spirits with a common thread throughout: all natural, no emulsifiers or stabilizers being used. A modern spirit from a modern distillery. Family of products includes Oaken Gin, Left Coast Hemp Vodka, Craigdarroch Whisky and Twisted & Bitter cocktail bitters. Oldest and largest certified craft distillery in British Columbia. Produce ultra-premium handmade Eaux de Vie, moonshine, Gin, Vodka & Single Malt Whisky including their signature "Spirit Bear" line. Small-batch distillery on the North Shore. James Lester and Richard Klaus are the two young men dedicated to bringing you their Amaretto, Vodka, and for the brave: Chili Vodka. 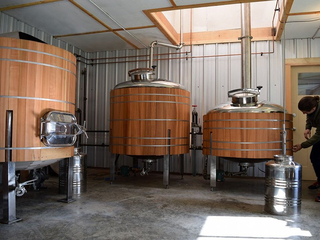 Family owned and operated organic distillery in the Coast Mountains. One of BC’s first artisan distilleries, they create award-winning organic Vodka, Gin, Whisky, Absinthe, Brandy and Liqueurs. Located in the Entertainment District of Penticton, rooted in the rich storytelling of a 7th gen pioneer farming family. Fun, historic, social, an outspoken brand not afraid to poke a little mischief. Western Canada’s oldest craft distillery spanning over a decade in the production of award-winning B.C. spirits. Produces spirits from Vodka and Gin, Liqueurs and Brandies as well as genuine Absinthe. Small-batch craft-certified distillery located in the heart of East Vancouver. Dedicated to combining old world distilling traditions with new world ingredients and ingenuity. Award winning spirits, fruit brandies and liqueurs, handcrafted since 2005 from Okanagan fruit, grapes and wine. One of the 2 oldest distilleries in British Columbia and pioneers in Craft Distilling. Family owned and operated, they evolved from a passion for the distillation of fine spirits using traditional distilling practices with their custom designed artisan copper pot still. Using the best BC organic grains, Liberty carefully ferments then triple distills in their handcrafted copper pot stills to produce ultra-premium quality spirits with true character and distinction. A collaboration between husband and wife team Doug and Dawn Lennie who share a passion rooted in creating truly special spirits using the highest quality ingredients available in BC. Reflects family farm and agricultural traditions that define the Kootenays. It marries heirloom, 100-mile-sourced products and pure spring waters to artisan distillation methods. Conceived by the minds at Phillips Brewing Company, the Fermentorium is a distilling house where unrestrained creativity and a hand-crafted approach shape unique recipes of all kinds. One of Kelowna’s newest distilleries specializing in premium vodka spirits. As one of BC’s Certified Craft Distilleries, they retain a personal touch ensuring each batch is of the highest quality. One of the newest craft distilleries in the lower mainland, Gillespie’s is owned and operated by distiller John McLellan and renowned Sommelier and Mixologist Kelly Ann Woods. Dubh Glas (dugh-luhs) in Gaelic means “from the dark water”. The pure ‘dark’ water used for making their spirits is sourced from a well located on the distillery’s property. Uses sustainable BC ingredients in order to obtain the finest product. Claire Vodka, voted best Vodka in NA at the 2014 American Distiller’s Festival, is of the highest quality and craftsmanship. Specializing in fine artisan spirits including Emperic Gin and Coven Vodka made from local and provincial ingredients. Trained as engineers, father-son duo Stephen and Jeremy Schacht are devoted to developing quality spirits with exceptional flavour. They have designed and built custom stills to create custom spirits. Previous articleHas your #TransitReferendum ballot arrived? Here’s what we’re voting about!